A very hard working group of young people arrived and were welcomed by Jim Duckworth to the Mangemangeroa Reserve. 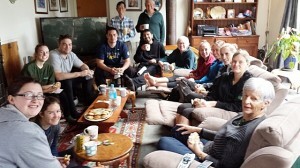 They spent the morning potting up kahikatea, taraire, and totara before retiring to a well earned rest in front of a roaring fire to feast on ecclse cakes baked by Jim. All in all 400 plants were potted into large pots using 12 large bags of potting mix. A magnificent effort by all involved.